Kanzashi are the Japanese hair decorations, adding an elegant touch to the traditional wear and general appearance of the ladies. Such decorations are seasonal, and their most common use nowadays is during Shinto weddings and by maiko/geisha. 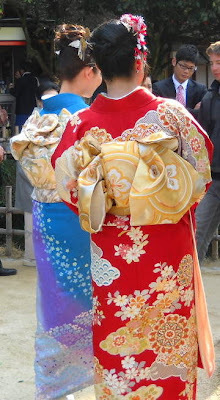 Maiko wears more hair decorations than a geisha. The latter's status can be immediately guessed by the way she wears her kanzashi. There are many varieties of kanzashi and many styles of wearing them. There are seven basic kanzashi. The season and the month dictate which kind of hair ornament should be worn.